Per-capita income in developed countries has stagnated, which most economists regard as a departure from the long-run trend. This column argues that zero long-term growth will be the new normal. In this zero-growth world, spending increases must always be balanced against spending reductions elsewhere or in the future, which creates a further problem: no politician could implement policy changes with such bleak outcomes. Since the Global Crisis, per-capita income in developed countries has stagnated. Europe took until 2015 to recover to the 2008 level of output. Unprecedented monetary expansion has failed to counter this stagnation. Even international trade, the ultimate engine of growth, is falling. The debate on what should be done has been largely conjunctural. Most macroeconomists interpret the lack of growth as a temporary phenomenon caused by the credit crisis. A neo-Keynesian view is that the prolonged slump reflects an excessive retrenchment of demand as firms, households and intermediaries are gripped by high debt and uncertainty about the future. The contrasting view attributes lack of growth to high taxation and heavy-handed regulation. The two views have opposing implications for public intervention, but both interpret the slump as a deviation from the path of long-term growth. Rogoff and Lo (2016) argue that growth rates will return to trend once the debt overhang created by a credit supercycle is reabsorbed. Proponents of a 'secular stagnation' interpretation driven by demographics suggest that further fiscal expansion, directed at public infrastructure, would prevent persistent negative effects of high unemployment and restart growth (Summers 2016). While experts climb aboard their chosen 'solution train' away from stagnation, it is rather the case that we may be permanently stuck in the station. There has been a structural transition to minimal, essentially zero, per-capita growth. Gordon (2012) argued that productivity-enhancing technological growth has slowed significantly. The late-stage IT revolution enhances the quality of our consumption services and rewards some innovators but, as the overwhelming evidence on wage polarisation suggests, in the real economy it appears to be creating fewer high value-added jobs relative to those it displaces. Academic work on long-term trends finds evidence that this has a highly redistributive impact (Döttling and Perotti 2016). What is the emerging evidence for a structural flattening of productivity growth? 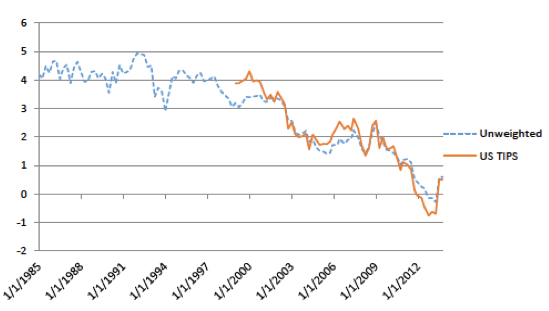 The most obvious trend is the structural decline of real interest rates since the mid-1980s (Figure 1). In simple neoclassical terms, this implies that that the return to real investment has steadily fallen. We can attribute the first phase to a declining inflationary premium—but rates fell during the credit boom, and so this has not been the case for more than 20 years. Simply put, there are not enough valuable investment opportunities for our savings, even though our savings rate has fallen. Most people believe this to be the work of central bankers since 2008, which suggests many of us are not paying enough attention to structural trends. In rich countries, corporate investment rates have been falling for decades, and there has been a steady drop in the external financing needed by firms (Figure 2). In most OECD countries, including Japan, Canada, UK, France and Germany, firms have become net lenders to the rest of the economy. Exceptions are countries in the distressed EU periphery, where the net financial position of firms has weakened. 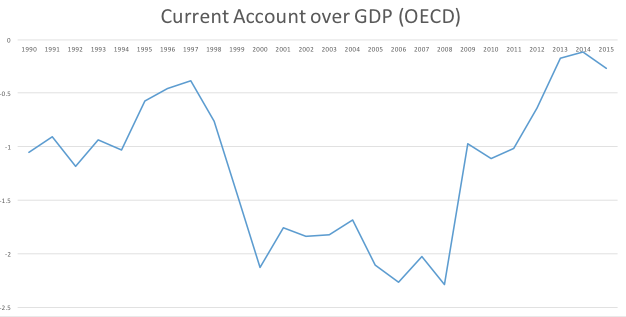 GDP growth has declined while public spending has continued to grow, meaning the ratio of public debt to GDP in developed countries has risen since the crisis (Figure 3). It rose by 40% in the Euro area, 50% in the US and doubled in the UK. In a few years, we have borrowed and spent the equivalent of half our annual income, and most went into support spending rather than direct bailout losses. Earlier deficit spending was flattered by high fiscal revenues directly associated with the credit boom, so this suggests fiscal spending over GDP was rising even before 2008. Since 1990 all private credit growth to the private sector in OECD countries is due to a doubling of the ratio of mortgage lending to total credit (Figure 4), and a steady rise in the ratio of household debt to income (Jorda et al. 2015). In OECD countries, there is more than eight times as much private credit as private investment (Figure 5). In other words, private leverage has risen well above what is needed for productive purposes, and households have increasingly borrowed against their wealth to fund increasing housing costs or spending. Thus, part of recent spending has come from long-term net wealth. Since 1998, rich countries have funded a rising credit-to-GDP ratio, even as the savings rate has declined, by importing capital from emerging markets. The net flow accelerated during the credit boom. While inflows are now lower, emerging markets are still net funders of rich countries. These huge capital flows largely reflect safety-seeking capital flight by emerging-market savers (Caballero and Krishnamurty 2008, Forbes 2011). 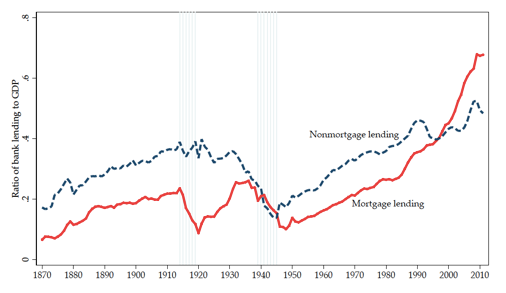 They were directed at funding the mortgage credit boom, rather than at investment (Figure 6). In most rich countries, there has been a steady decline in their export response to changes in the exchange rates. In other words, rich countries are increasingly unable to expand output even when their price-competitiveness increases. A steady decline in investment opportunities would be a common explanation for all these trends—although, individually, each has alternative explanations. By its most common definition, secular stagnation arises when negative rates are needed to balance saving and investment, and stabilise unemployment (Baldwin and Teulings 2014). The long timespan of falling real rates suggests the neoclassical view that savings have been exceeding profitable investment for some time. This interpretation suggests that a steady drop in productivity growth has already occurred, as Gordon (2012) has argued. The US Congressional Budget Office still projects a 1.5% long-term per-capita growth rate.1 But how do economists estimate long-term growth potential? The truth is that there is no objective measure of productivity growth. Our best guess is to extrapolate past growth. Consider our current methodology. First we deduct the effect of increased factor use (capital and employed labour) from GDP growth. We attribute the unexplained residual as growth in 'total factor productivity' (TFP), which we interpret as a permanent shift in technology. We assume that TFP shifts the future productivity frontier, and so we extrapolate this into the future as a permanent change. Our approach is based on a rational expectation frame that assumes sustainability of economic choice, and ignores financial intermediaries, asset markets and credit cycles. So, by construction, any increase in spending boosts GDP and produces higher estimates of productivity, even though spending growth may simply be driven by increased borrowing rather than higher income. By itself, this would not distort a proper measurement of long-term growth if debt-funded spending today reflected a rational expectation of higher future wealth, and asset prices measured future productivity growth. The belief in rational consumption smoothing implies a redistribution of consumption to today in expectation of greater wealth. There are two problems with this. First, what if agents and markets miscalculate future wealth? Second, what if others are expected to repay the borrowing? In this case, excess spending may be misunderstood for a sign of productivity growth, households would overborrow and banks overlend against a presumption of ever-rising wealth. The short-term boost to consumption would ultimately result in a net reduction of wealth, depressing future spending capacity once households adjust their expectations. The current slump would then reflect a healthy rebalancing of spending plans. Lower growth, or higher quality of life? It is hard to estimate the potential growth in productivity that technological progress makes possible. Even if there is a steady contribution of technological progress to growth, it may be countered by negative real trends. Two evident counter-trends would be the costs (especially healthcare) of increasing longevity, and an increase in standards that limit pollution or prevent accidents and other hazards at work. These trends clearly reflect quality-of-life improvements in rich countries, and they suggest benefits of slower income growth. By itself however, a higher quality of life for the employed or the insured does not ensure that losers are compensated, or feel compensated, for slower income growth. There are also trends that reduce potential growth, such as increasing conflict in the world and political disruption. Ultimately the effect is the same. Realistic projections should recognise zero growth as the new normal. In a zero-growth scenario, no act of goodwill can restore growth. As investment returns drop, spending growth cannot be sustained. The most urgent correction we can make at present might be to adjust expectations on what public policy or money creation can do. In recent years, central banks have been pushed to take the burden of addressing the lack of growth. Adding oil to an engine makes it work better when it is jammed, but it is no substitute for a lack of fuel. So, while extraordinary monetary policy has helped to absorb the debt overhang, by itself it cannot produce growth. Deficit spending, in turn, temporarily adds fuel—but does not increase engine speed. There are many indicators that easing credit does not by itself restore growth. There is little evidence of financial constraints for large firms, whose net leverage is falling as firms are sitting on large (and rising) cash holdings. 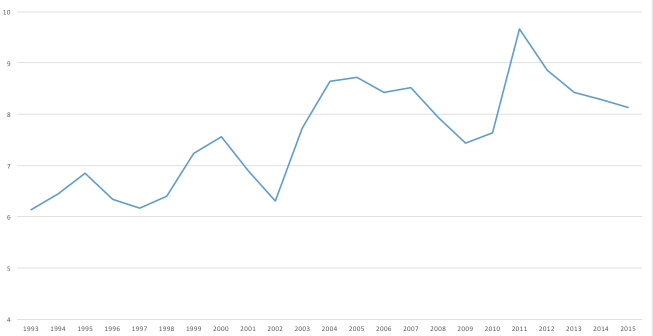 Net equity flows have been large and negative since the 1990s, and even since the crisis. Admittedly, innovative firms in developed countries are increasing intangible investment. Emerging evidence suggests that this requires less external finance (Döttling et al. 2016), as the investment is largely in human capital. This means the gains to innovation flow largely to the innovators, and also that lowering the cost of capital, by itself, does not boost innovation. The sensitivity of corporate investment to Tobin’s Q (a traditional, if not ideal, measure of responsiveness of investment to the value of capital) has been steadily falling. Market expectations on inflation have long been the policy target for the next five to 10 years, and there has long been little market hedging against any interest rate rise. Interest rate rises since the US presidential election probably reflect the nominal effect of higher inflationary expectations or fears of fiscal recklessness. Emerging markets have opportunities to catch up. This appears unlikely to restore growth in richer countries though, as world trade growth has also flattened. Sensible reforms can enhance growth, even in rich countries. Relaxing regulatory standards or reducing entitlements would enhance growth, but inevitably be redistributive. The challenge in the current populist political climate would be how policymakers ensure support for sensible rebalancing, that will create winners and losers with limited room for compensation. It is much easier to make redistributive changes when it is possible to promise future growth, rather than create a de facto zero-sum readjustment. Long-term economic trends suggest that the developed world has entered a phase in which technology still enhances productivity by innovative firms and skills, but no longer increases average productivity of other factors. There are no simple remedies, as policy tools have already been fully deployed. : Using policy tools further may create the illusion of growth, while we would be simply shifting resources from the future. As Chancellor Merkel has stated recently, by many measures we have the highest living standards in history. It is time to restate our expectations and move to a sustainable, realistic policy approach. A responsible approach would factor in zero long-term growth as the new normal, the average. In this case, public spending outside crises should operate with the expectation of zero-sum growth. Decisions on legitimate spending increases must be balanced against reductions elsewhere, and balance the present with the future. Entitlement programs should be modest, and balanced to preserve intergenerational balance and sustainability. This will impact fiscal, pension and even macroprudential policy. Few politicians would dare to lead this process. The prospects for sensible adjustment are bleak—not only because the changes are dismal, but also because they are unlikely to happen at all. It is politically tempting to blame a “negative sentiment” that impedes us to return to the golden growth path to which we feel entitled. This is a golden excuse for more deficit spending, but in the end it is simply an extension of self denial. Author’s note: I am grateful to many colleagues for discussions on this theme. I would like to thank in particular Larry Summers, Franklin Allen, Viral Acharya, Luc Laeven, Stijn Claessens and Joost Zuidberg. Baldwin, Richard and Coen Teulings (2014) Secular stagnation: Facts, causes, and cures, CEPR Press. 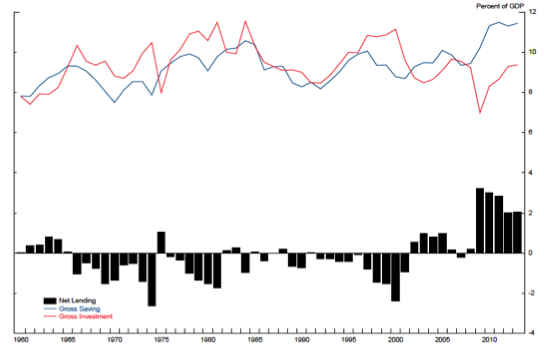 Gordon, Robert (2012), “Is US Economic Growth Over? Faltering Innovation Confronts the Six Headwinds”, NBER Working Paper 18315. Hansen, Alvin (1938), Speech published as A H Hansen (1939), “Economic Progress and Declining Population Growth”, American Economic Review, 29: 1–15. It attributes the slowdown to unfavorable demographic trends, the original explanation for secular stagnation in its initial formulation by Alvin Hansen in 1938.